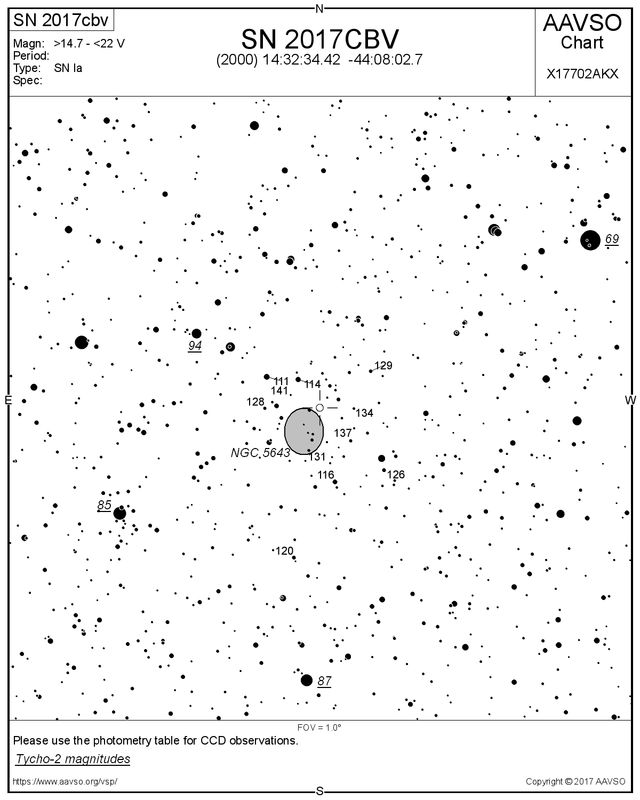 Have you got any information regarding this Supernova? #SN2017cbv está más brillante que la semana pasada. Mag 11.5. Desde el balcón de casa, 4 min, 8" F/6.3. Some friends did not learned that facebook is not the proper way to comunicate important observations. Hi AAX. I'm Guillermo Abramson. I just created an account here. Please find hereby an image of my observations of last night. 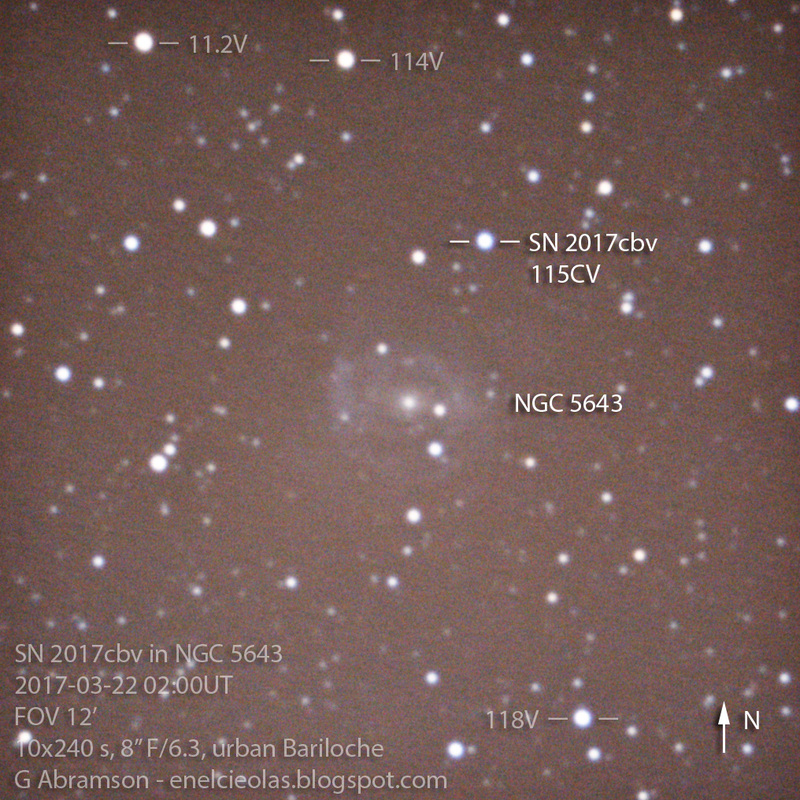 Comparison stars are shown, SN2017cbv is clearly brighter than the one I saw here, whence I knew about it. I estimate its magnitude at 11.5. Meade LX10 (8" F/10 SCT, reduced to F/6.3). Standard mount, autoguided with homemade realy feeding back to hand controller. Canon T3i unmodified at prime focus. 10x240 sec, ISO1600, 4 darks, median stacked, RGB background calibration, minimal post processing. Taken from downtown Bariloche (-41.1392861,-71.2993278), urban on the darker side. Excellent seeing (unusual). Sebastian Otero and other friends can help you, if necessary. It's important we have this estimate. I just got an obscode and I am trying to do it. When I submit I get a blank page, something must be wrong. I used my login to insert *your* observation with your observer code (AGUA). After that you can edit or update further information. Important in this time is: Date UT, magnitude, comps and chart used. The chart #X17702AKX has the comps 114 and 116 is that ploted as "114V" and "118V" in your image. Oh, thanks! I was entering the UCAC4 names of the stars instead of the magnitudes, perhaps that threw the form spinning away. I take notice.